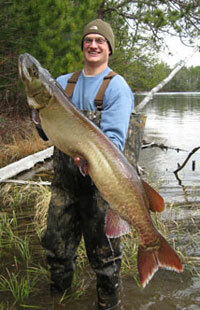 The muskellunge (Esox masquinongy) is one of Wisconsin's most important and unique trophies. It is so highly valued that the State Legislature proclaimed it the official State Fish in 1955. More world records have been landed in Wisconsin than anywhere else. The current state and world record is a tremendous 69 pounds and 11 ounce fish taken from the Chippewa Flowage. Wisconsin muskellunge waters (Pub No. FH 515) - information on musky life history, research, management and classification of musky waters, including a list of lakes and rivers that contain muskellunge and the type of access available. Trophy fishing opportunities - based on water productivity and growth potential of the fish and facilitated by higher minimum length regulations, anglers fishing these waters will have a better chance of catching a "trophy" musky. Long live the kings from Wisconsin Natural Resources Magazine. For a complete listing of musky fishing regulations, see the Guide to Wisconsin hook and line fishing regulations.